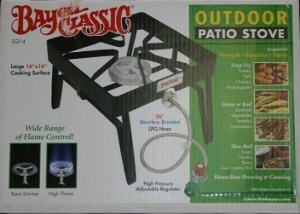 The Bayou Classic Square Propane Burner (SQ14) is one of Bayou Classics more popular propane burners. SQ 14 has a large cooking surface. 6" cast-iron fry burner. 36" braided hose and 10 P.S.I. Adjustable regulator. 55,000 BTU. Height is 13", Stand Type: Heavy-Duty Steel.